This Sunday, there will be no Sunday School, as we celebrate the Feast Day of St. Nicholas of Myra, our Parish's namesake. Who was St. Nicholas? St. Nicholas was born during the third century in the village of Patera (now Turkey.) His wealthy parents, who raised him to be a devout Christian, died in an epidemic while Nicholas was still young. Obeying Jesus' words to "sell what you own and give the money to the poor," Nicholas used his whole inheritance to assist the needy, the sick, and the suffering. He dedicated his life to serving God and was made Bishop of Myra while still a young man. Bishop Nicholas became known throughout the land for his generosity to those in need, his love for children, and his concern for sailors and ships. Under the Roman Emperor Diocletian, who ruthlessly persecuted Christians, Bishop Nicholas suffered for his faith, was exiled and imprisoned. The prisons were so full of bishops, priests, and deacons, there was no room for the real criminals—murderers, thieves and robbers. After his release, Nicholas attended the Council of Nicaea in AD 325. He died December 6, AD 343 in Myra and was buried in his cathedral church, where a unique relic, called manna, formed in his grave. This liquid substance, said to have healing powers, fostered the growth of devotion to Nicholas. The anniversary of his death became a day of celebration, St. Nicholas Day, December 6th. Through the centuries many stories and legends have been told of St. Nicholas' life and deeds. These accounts help us understand his extraordinary character and why he is so beloved and revered as protector and helper of those in need. As the rising costs of household necessities make more demands on the budgets of our clients, the difference that our donations can make is huge because the personal care items that we collect cannot be purchased with Food Stamps. Please watch for sales and shop generously for laundry and dish detergent/ toilet paper, paper towels and tissues/ feminine sanitary supplies and shampoo, conditioner, combs and brushes / toothbrushes and toothpaste/ bar soap deodorant, razors, and shaving cream. The LINEN MINISTRY needs gently used blankets and towels. Thank you! Joseph, son of Jacob and Rachel, lived in the land of Canaan with ten half-brothers, one full brother, and at least one half-sister. He was Rachel's firstborn and Jacob's eleventh son. Of all the sons, Joseph was preferred by his father, and this is represented by a "long coat of many colors". When Joseph was seventeen years old he had two dreams that made his brothers plot his demise. In the first dream, Joseph and his brothers gathered bundles of grain, of which those his brothers gathered, bowed to his own. In the second dream, the sun (father), the moon (mother), and eleven stars (brothers) bowed to Joseph himself. These dreams, implying his supremacy, angered his brothers. 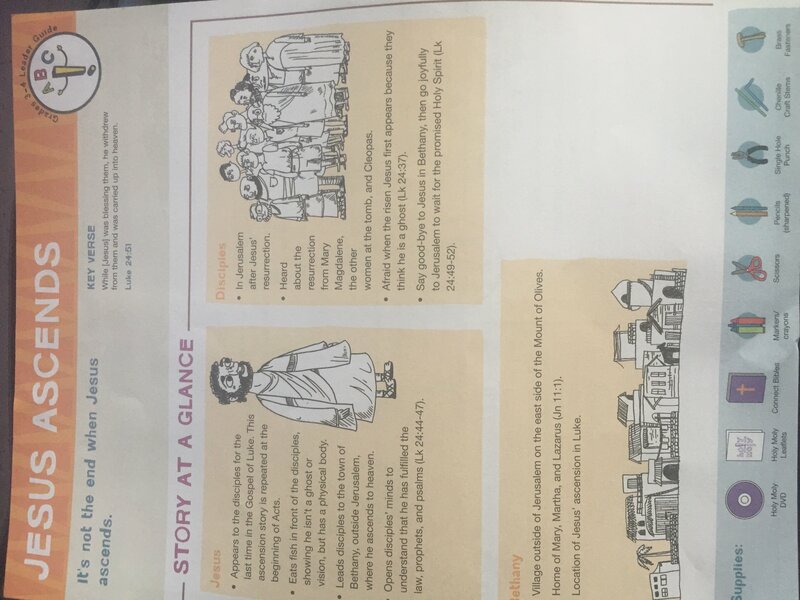 In Sunday School this week, the children will learn how Joseph proves that not all attention is good attention. During this week's lesson, we will read this passage and discuss the story. We will watch a short video, and watch what Joseph does before his brothers' faces turn colors (hint: Green = envy. Red = anger.) We will talk about the video through interactive, thoughtful questions, such as: Which son was Jacob/Israel's favorite? How do you know? What surprised you about Joseph's actions? Have you ever felt like someone got a prize you deserved? How did you react? What, if anything, helped you feel better? What kinds of dreams do you have? Who do you like to tell about your dreams? Next, we will create a craft inspired by this thought-provoking story. is this Saturday, November 18th 10am-3pm! Sunday School is out for the summer! The First Sunday After Pentecost is Trinity Sunday, one of the seven principal feasts of the church year. Trinity Sunday celebrates “the one and equal glory” of Father, Son, and Holy Spirit, “in Trinity of Persons and in Unity of Being” (Book of Common Prayer, p. 380). In Sunday School this week, the children will learn to have a better understanding of the three persons of God also known as the Trinity. For example, there are several popular legends about how St. Patrick used the shamrock to help explain the mystery of the Trinity, comparing the single plant with three leaves to the One Triune God with three separate and distinct Persons. During this week's lesson, we will discuss this story. We will watch a short video, and talk about the video. Next, we are going to make a craft which combines St. Patrick’s Shamrock with the “Glory Be” prayer, creating a poster to help us remember to always profess our faith in the Blessed Trinity. Please, all try to join us this Sunday, June 11th immediately following the 10am service, when we will be having a potluck luncheon to commemorate the final day of Sunday School before summer break, thank all of our Sunday School teachers, and give everyone a chance to meet and greet with our new Rector, Reverend Leigh Hall. Please join us for this exciting celebration! Our SUMMER READ-A-THON PROGRAM is underway! The Read-a-Thon supports the ministry of The Friends of Darbonne, providing scholarship money for children attending the St. Esprit School in Darbonne, Haiti. For anyone who has not yet received their information packets, we have more information packets available to anyone who'd like to participate in our Read-a-Thon this summer, that directly funds such an important and life-changing cause. A planning meeting for all interested volunteers will take place with Mother Leigh presiding, after the 10am service on Sunday, June 18th. We hope to see many of you, and welcome any ideas you may have, as well! We can always use a few extra helping hands, so if you would like to volunteer any of your time at all to assist us this year, please come to the planning meeting, or you may also contact Jennifer Klein at jklein71@optonline.net, or Dana in the office at stnicholasnewhamburg@gmail.com. Mark your calendars and help us spread the word! With the arrival of our new Rector, this year's VBS is sure to be a great one! PERSONAL CARE PANTRY needs help stocking their shelves for families in need. If we were to buy even ONE extra item during our own family's grocery shopping trips, and brought it to church the next Sunday, the difference we could make in so many local families' lives would be tremendous! The items currently most needed are: Paper towels, toilet paper, tissues, laundry detergent, hair conditioner and dish washing liquid. Non-perishable food items are always needed, too.Linens Ministry could use gently used blankets and new pillows.Furniture Ministry needs able bodied volunteers to help with pick-up and delivery. Please see Liz P. or Eileen D. for more info. Thanks! Sunday School is for kids ages 4-12 and takes place in the undercroft from 10-10:30. Teachers, the current teaching schedule can be found here. Please let Jennifer Klein know if you need to make any changes. Thanks for all you do! The Ascension marks the conclusion of Jesus' post-resurrection appearances. It is the final elevation of his human nature to divine glory and the near presence of God. The Ascension is affirmed by the Nicene and Apostles' Creeds. The Ascension is celebrated on Ascension Day, the Thursday that is the fortieth day of the Easter season. It is a principal feast of the church year in the Episcopal Church. Jesus appears to the disciples for the last time in the Gospel of Luke. This ascension story is also repeated at the beginning of Acts. Jesus eats fish in front of the disciples, showing he isn't a ghost or vision, but has a physical body. He leads disciples to the town of Bethany, outside Jerusalem, where he ascends to heaven. Jesus opens disciples' minds to understand that he has fulfilled the law, prophets, and psalms. 44 He said to them, “This is what I told you while I was still with you: Everything must be fulfilled that is written about me in the Law of Moses, the Prophets and the Psalms.” 45 Then he opened their minds so they could understand the Scriptures.46 He told them, “This is what is written: The Messiah will suffer and rise from the dead on the third day, 47 and repentance for the forgiveness of sins will be preached in his name to all nations, beginning at Jerusalem.48 You are witnesses of these things. 49 I am going to send you what my Father has promised; but stay in the city until you have been clothed with power from on high.” 50 When he had led them out to the vicinity of Bethany, he lifted up his hands and blessed them. 51 While he was blessing them, he left them and was taken up into heaven. 52 Then they worshiped him and returned to Jerusalem with great joy. 53 And they stayed continually at the temple, praising God. In Sunday School this week, the children will learn that it's not the end when Jesus ascends. During this week's lesson, we will read this passage and discuss the story. We will watch a short video, where we will watch to see how the disciples act when they see Jesus, and talk about the video through interactive, thoughtful questions, such as: Why did the disciples hide from Jesus? When have you been very surprised to see someone - how did you react? I wonder if the disciples thought Jesus was there to stay? What do you think Jesus said to them when he was saying goodbye? When have you said goodbye to someone you wouldn't see for a long time - what did you talk about? What helps you remember them? And, I wonder what helped the disciples remember Jesus? Next, we will construct a craft where they can re-enact the wonderful event of The Ascension of Jesus into Heaven. Our SUMMER READ-A-THON PROGRAM is underway! The Read-a-Thon supports the ministry of The Friends of Darbonne, providing scholarship money for children attending the St. Esprit School in Darbonne, Haiti. Last Sunday during Sunday School, we handed out information packets, and held a brief program for the children. They learned what life is like for many children in Haiti, and how without scholarship funding, it is much, much more difficult to receive an education than what we are accustomed to with our public school system in the States. We were honored to host a few special guests: Maya Hennebery, from Zion Episcopal Church and her friend, Gisele, who currently lives in Manhattan but was born and raised in Haiti. Also visiting us was Marcy Wagman, from Zion Episcopal Church, and is the chairperson for the Friends of Darbonne. I'd also like to thank Joan Freeman, who organizes and puts a great deal of her time to this project for St. Nick's every year. Our Sunday School children were treated to an authentic Haitian song, sung so beautifully and movingly by Gisele. THANK YOU to our special guests and to our own Outreach Committee, who donated a variety of delicious Haitian-themed food to enjoy during coffee hour. For anyone who was not able to attend our kick-off, we have more information packets available to anyone who'd like to participate in our Read-a-Thon this Summer, that directly funds such an important and life-changing cause. On June 1st, 2107... We welcome our new Rector, Rev. Leigh Ellen Hall! LAST DAY OF SUNDAY SCHOOL & TEACHER APPRECIATION DAY will be on Sunday, June 11th. Please join us for this fun celebration! PERSONAL CARE PANTRY needs help stocking their shelves for families in need. If we were to buy even ONE extra item during our own family's grocery shopping trips, and brought it to church the next Sunday, the difference we could make in so many local families' lives would be tremendous! The items currently most needed are: Paper towels, toilet paper, tissues, laundry detergent, hair conditioner and dish washing liquid. Non-perishable food items are always needed, too. Linens Ministry could use gently used blankets and new pillows. Furniture Ministry needs able bodied volunteers to help with pick-up and delivery. Please see Liz P. or Eileen D. for more info. Thanks! This Sunday is our HAITI READ-A-THON KICK-OFF, and the children will hear all about going to school in Haiti from our Haitian-born special guest (and friend of the Parish) Gisele - appropriately, since the Read-a-Thon raises money for scholarships for Haitian school children. We will hand out the information packets that day, and the children will have the chance to ask our fellow church members to kindly sponsor them during this summer-long service project. Please consider supporting our great Sunday School children and the life-changing organization of The Friends of Darbonne. Come this Sunday to learn more about Haiti, school in Haiti, and this important outreach project! As in past years, our kick-off will conclude with a wonderful coffee hour with lots of Haitian treats. Thanks to Joan Freeman and our Outreach Committee for putting this together! Please join us as we officially celebrate and welcome Rev. Leigh Ellen Hall to St. Nick's, and give thanks to our Sunday School teachers for another great year! Mark your calendars and help us spread the word! We are looking for volunteers to lend us a helping hand. If you can volunteer any amount of time: a day or two, an hour, anything would be appreciated! Then please contact Jennifer Klein atjklein71@optonline.net or call her at (845)242-9857. We will have a VBS planning meeting in early June - stay tuned for details. We are looking forward to a great week of VBS! PERSONAL CARE PANTRY needs help stocking their shelves for families in need. The items currently most needed are: Paper towels, toilet paper, tissues, laundry detergent, hair conditioner and dish washing liquid. Linens Ministry could use gently used blankets and new pillows. Furniture Ministry needs able bodied volunteers to help with pick-up and delivery. Please see Liz P. or Eileen D. for more info. Thanks! 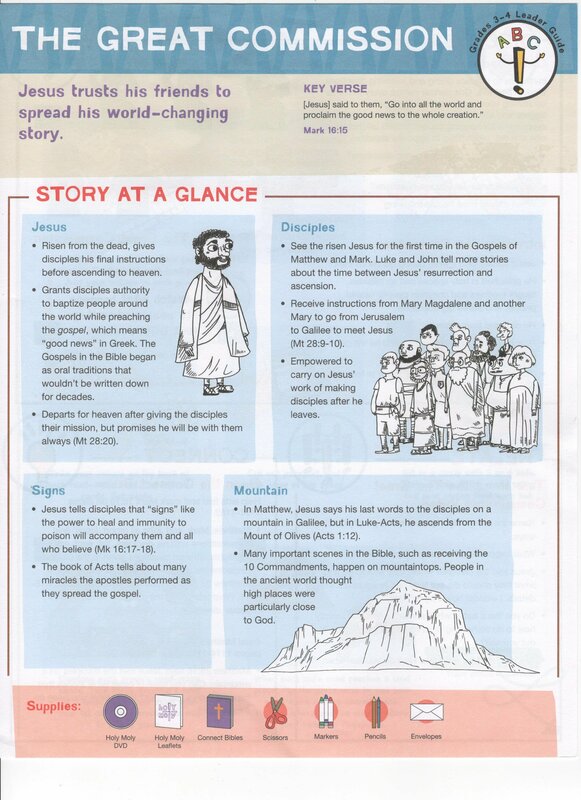 In Sunday School this week, the children will learn about how Jesus trusts his friends to spread his world-changing story. During this week's lesson, we will read this passage and discuss the story. We will watch a short video, where we will watch what happens to people when they first trust Jesus, and talk about the video through interactive, thoughtful questions, such as: What happened when people trusted Jesus? Do you like it better when someone tells you exactly how to do something or when they let you figure it out yourself? And Jesus trusted the disciples. How do you feel when someone trusts you? Next, we will construct a craft called "Go Into All The World" and play a game to discover how they can witness in the world. Our SUMMER READ-A-THON PROGRAM kicks off Sunday, May 21! The Read-a-Thon supports the ministry of The Friends of Darbonne, providing scholarship money for children attending the St. Esprit School in Darbonne, Haiti. We will hand out the information packets that day, and will have a brief program to present to the children during Sunday School, including a special visit from a Haitian friend of our parish who will talk to the children about life in Haiti. As in past years, our kick-off will conclude with a wonderful coffee hour with lots of Haitian treats. Mark your calendars and help us spread the word! "Friends, haven't you any fish? "When they reply in the negative, Jesus responds: "Throw your net on the right side of the boat and you will find some". [After doing so, "they were unable to haul the net in because of the large number of fish". Realizing the identity of their advisor, the Beloved Disciple (later said to be John) said to Peter, "It is the Lord!" at which Peter jumped into the water to meet him (an aspect of the story often illustrated in Christian art), while the remaining disciples followed in the boat, towing the net, which proved to be full of 153 large fish. Jesus prepares and eats breakfast on the beach with his friends. Eating proves Jesus has a real body and isn't a ghost, spirit, or vision. This passage has traditionally been one of the liturgical readings following Easter. In Sunday School this week, the children will learn to Stop, look and listen! God shows up in everyday places. During this week's lesson, we will read this passage and discuss the story. We will watch a short video, where we will watch to see how many fish they catch, and talk about the video through interactive, thoughtful questions, such as: How many fish did they catch? (The Bible says 153.) I wonder what they were thinking about all night long? What do you think about when things aren't working out? Then, we will construct a craft where the children will create a "Breakfast Boat" to recreate Jesus and the disciples' breakfast by the sea. Young Artist's Benefit Concert for Scenic Hudson is thisSunday, May 7th at Bowdoin Park (Pavillion 5) at 2:00pm. Produced by our own Aidan Cuite, young musicians from the Hudson Valley and surrounding areas will gather for one afternoon, all playing music to raise awareness of and funds for Scenic Hudson. All the performers generously donate their time and talent to make this great afternoon of music possible. We hope to see you there! We will read John 20:19-29, which tells of the appearance of Jesus to his disciples, with Thomas the Apostle present, on the Sunday following his resurrection. At first, Thomas refused to believe that the resurrected Jesus had appeared to the ten other apostles, until he could see and feel the wounds received by Jesus on the cross. At that time, Jesus said to Thomas, "Put your finger here, and see my hands; and put out your hand, and place it in my side; do not be faithless, but believing." Thomas answered him, "My Lord and my God!" Jesus said to him, "Have you believed because you have seen me? Blessed are those who have not seen and yet believe." 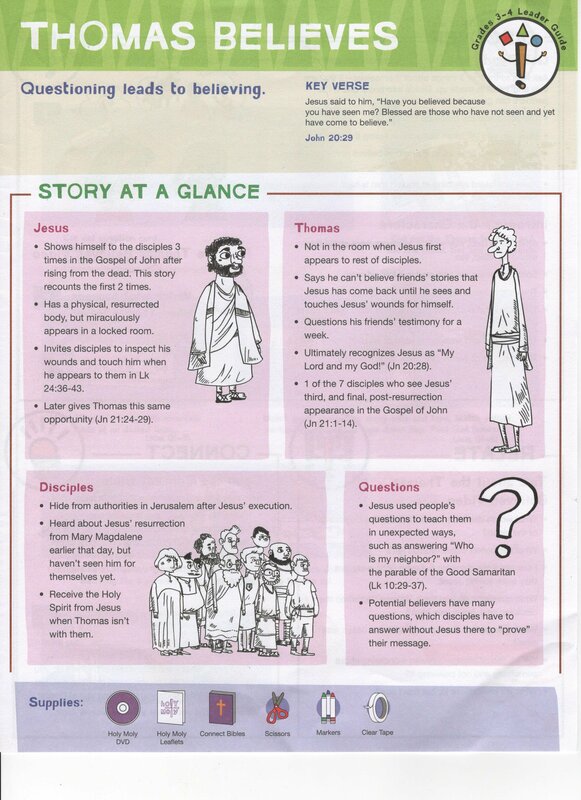 In Sunday School this week, the children will learn that questioning leads to believing. During this week's lesson, we will read this passage and discuss the story. We will watch a short video, where we will watch what happens when Thomas leaves, and talk about the video through interactive, thoughtful questions, such as: What words describe the disciples at the beginning of the video? What happened when Thomas left? What questions do you think Thomas had when the disciples said Jesus was alive? What changed so Thomas believed that Jesus was alive? And, what do you believe in, but can't see? Then, we will construct a craft where the children will create a "Thomas Action Figure" to illustrate how to help ask important questions. Vacation Bible School will be held from Monday, July 17th through Friday, July 21st. More details to be announced soon. We hope to see you, so - Please Save the Date! THANK YOU Because of your generosity, and the caring guidance of our Outreach Committee, our Children's Lenten Project to benefit Episcopal Relief and Development was very successful. Last Sunday, our Sunday School children voted to use our proceeds to purchase 3 goats, 1 flock of chicken, 5 mosquito nets, and 2 pigs for a village in a developing country. What a difference that will make! Sunday School is for kids ages 4-12 and takes place in the undercroft from 10-10:30. Teachers, the current teaching schedule can be found here. Please let me Jennifer Klein know if you need to make any changes. Thanks for all you do! Again, a very joyous Eastertide to all! The children will be continuing their Sunday School lessons with teachers Joan and Jennifer. EPISCOPAL RELIEF & DEVELOPMENT VOTE! This Sunday, the kids will be voting on how to divvy up their Episcopal Relief and Development collection, and they will be amazed at how much they've raised! We'll review the options, what each animal costs, and take a vote on how to distribute our money. Thanks for all your help making this a success this year! GREAT NEWS FROM OUR VESTRY "It is with great joy that we announce today the calling of our new Rector, Rev. Leigh Ellen Hall. Leigh is currently Associate Rector at St Paul’s Church in Albany, Georgia. Upon her arrival on June 1, she will become the second Rector in our parish’s history. Her calling was made in a unanimous vote of the Vestry, following a unanimous recommendation of the nine member Search Committee. We can’t wait for the entire congregation to get to know Leigh and concur with our conviction that our parish will flourish under our new Rector. As we said to the congregation when we started this transition last May - the Church of St Nicholas on the Hudson has a bright future!" VACATION BIBLE SCHOOL IS JULY 17th - 21st More details will be decided after the arrival of our new Rector, and with her arrival and the support of our wonderful members who donate their time and creativity each year, no doubt we will have another fun and inspiring VBS this summer! Mark your calendars and help us spread the word! Sunday School is for kids ages 4-12 and takes place in the undercroft from 10-10:30. Teachers, the current teaching schedule can be found here. Please let me (Jennifer Klein) know if you need to make any changes. Thanks for all you do!